If you go through life being called “Jananice” or “Janet” or “Which one are you?” (I do not have a twin, for the record) you contemplate changing your name. When my sister and I played we often took on new personas. Most often I chose Angie from that TV show (don’t pretend you don’t remember). When it wasn’t Angie, we fought over who would be Ashley. I don’t know why. And that was when we weren’t reenacting episodes of “Solid Gold”. 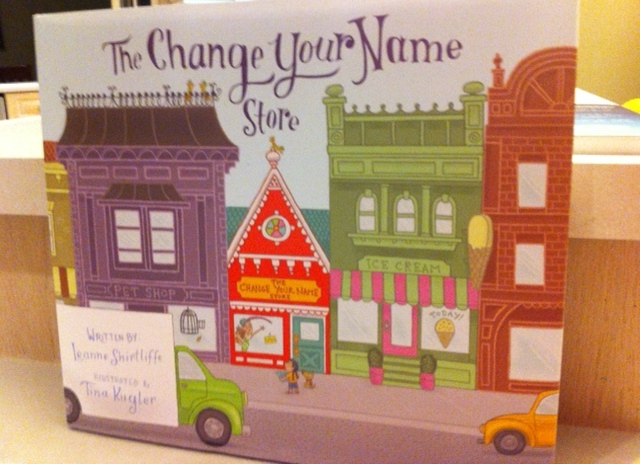 The very talented, Leanne Shirtliffe, recently penned a children’s book The Change Your Name Store and I knew I had to have it. I thoroughly enjoyed her first book, Don’t Lick the Minivan and was anxious to see her handiwork with children’s literature. We were not disappointed. This story follows the adventures of Wilma Lee Wu who decides to change her name. She finds the Change Your Name store where one can try on different names to find the right fit. The catch is that when you try one, you are transported to the country of origin. Love this. As a parent of all boys, I appreciate that the main character is a spunky girl who does not fall into some of the stereotypes of young female heroines. As a teacher, I value the multiculturalism celebrated in this story along with the underlying theme of liking who you are. The rhyming narrative flows naturally and engages young and old. The illustrations by Tina Kugler are fun and inviting. They capture the feel of the story and the characters just right. Our boys enjoy finding all the little details on each page. Wilma’s pet dog is an excellent addition and ALMOST makes me want to get a pet. When asked what he liked best about the story, our seven-year-old replied, “that you get to visit the country when you try a name.” I agree. When asked what I should changed my name to, without hesitation he answered, “Babette”. Not bad, and definitely better than what they wanted to call their youngest brother (Boomer). I wonder what country Boomer comes from? This book should be on your shelf.